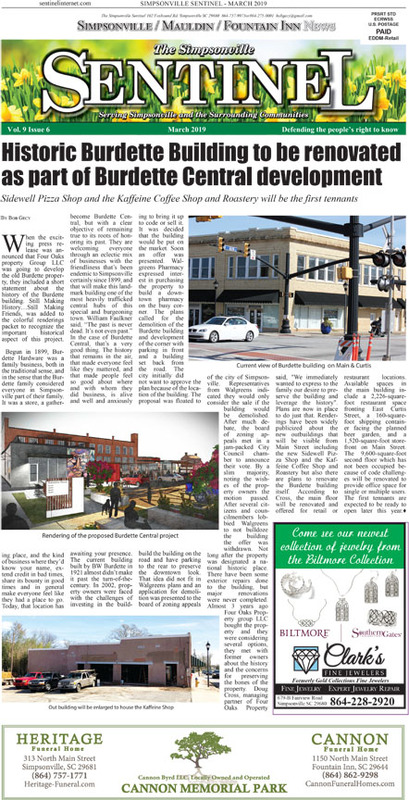 Two noted historians from Piedmont have worked diligently since the beginning of the Piedmont Mill to preserve the history and artifacts of the area. Albert Smith Rowell, who used the pseudonym Old Coin, came from New Hampshire in the 1870s and began searching for tokens of life in the upstate as soon as he arrived. 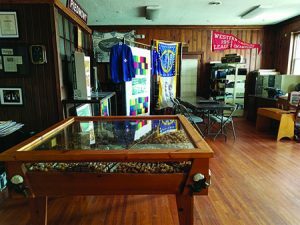 Over time he built a collection of over 40,000 items, mainly Native American points and pottery sherds which were plentiful in Southern Greenville near waterways particularly. After 1906 his artifacts were housed in the YWCA building until it burned in the early 1940s. Most of his remaining collection was then dispersed among his family and other locals. Few of those remain in the current collection of Don Roper (Saluda Sam), who began his dedication to Piedmont history in the 1940s. 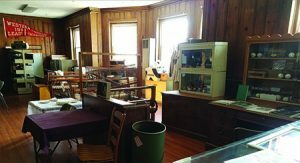 But over the past year Roper’s Historical Collection Museum housed in the Piedmont Community Building has been reorganized by the Piedmont Historical Preservation Society. This group has been supported by Don and the Bonnes Amies and Mother’s Clubs. Both clubs have provided organizational materials and time. There is still much to be done to allow easy access to documents and artifacts for research and understanding, but these groups are dedicated to this effort. 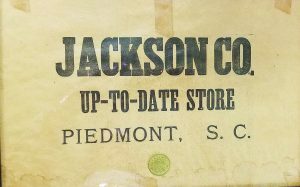 Jackson Mercantile Piedmont Mill Store ca. 1900 with 10 cent loonie. 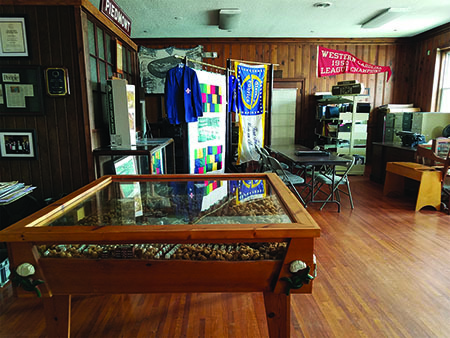 Some of the most treasured items include scrapbooks filled with mill athletic articles and photographs, display cabinets of signed baseballs, gloves, and bats, uniforms from baseball and football greats, trophies from the Piedmont mill and high school teams, the mill corner stone and an important bale of cotton, and mercantile display cases and tokens called “loonies”. Cases of books relating to sports, WWII, textile mills, and South Carolina history are dispersed throughout the museum. One of the unique features of the collection is the finely hand-crafted, floor standing, glass encased, diorama of the mill and village at the turn of the 1900s. 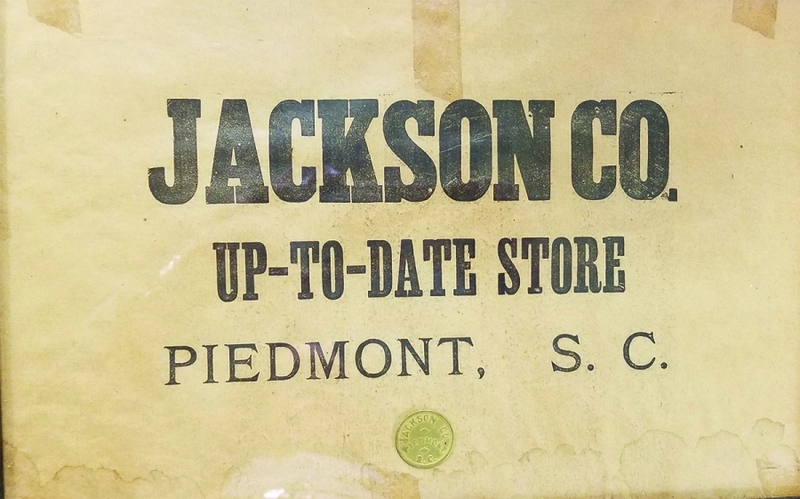 Also, for study are large maps of Greenville and Anderson Counties prior to 1900, and maybe best of all is the photograph collection, including many items from 1900 and prior. Probably the most beautiful and important are the Limoges, gold rimmed, hand-painted plates that Mr. Rowell’s wife, Clara, delicately painted in 1892 depicting scenes of Old Piedmont, including the 1st and 2nd Churches, the Washing Hill, the 2nd School, the Fireplace in the 1st House, and the Rowell’s home, Curiosity Castle, where was housed his early collection. Don Roper’s Piedmont Historical Collection museum will be reopened for the Textile Heritage meeting on the morning of April 7th. Then the goal is to provide access regularly beginning in the fall of 2018. A Piedmont friend, Susan Allen, says that all roads lead to Piedmont. Everywhere she goes she meets folks that have relatives or know someone from Piedmont. The mill was called the kindergarten of the southern textile manufacturing boom, so innumerable supervisors were trained here and went out to start other textile companies and mills throughout the south. Piedmont’s history runs deep along the mighty Saluda river from Native American villages to Piedmont Manufacturing Company’s village. Come and visit the museum to learn more. Maybe you had a friend or relative from Piedmont. For a tour, email acpeden07@gmail.com.